My first brew in this apartment (the Saison du Pom) was also my first all-grain batch using a mash tun. Things went smoothly with that brew, and I actually got the sense, working in this new space, that I would have enough room to take advantage of some upgrades of my brewing apparatus. 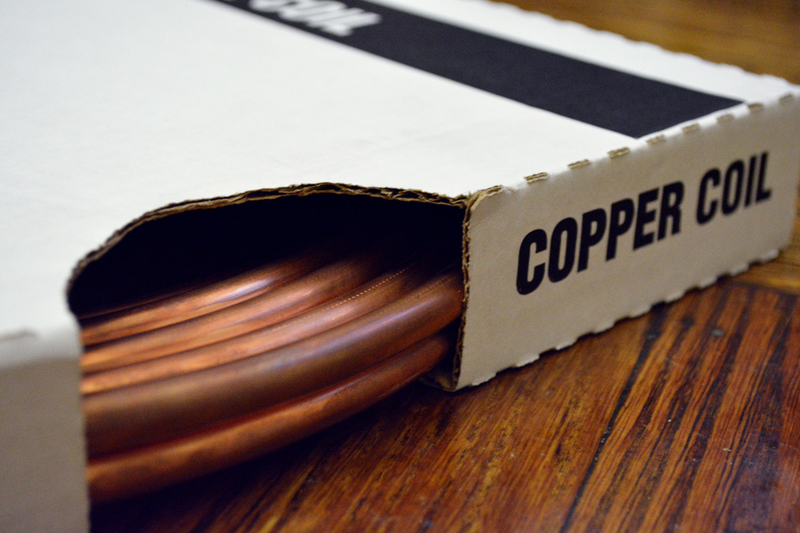 At first it was a new thermometer, then I started eyeing a new brew pot, and soon enough I was scouting out prices on soft copper tubing. One of the aspects of my brews that I’ve continued to have poor control over is chill times. How fast you bring your wort from boiling hot to the yeast pitching temperatures affects the quality of your cold break (coagulation of proteins etc. that settles out during cooling) and your risk of contamination. While I consider the risk of contamination to be pretty low, the only place I can currently fit my 4 gallon kettle to chill my wort is in the bathtub, which makes me a little more leery of bacterial baddies than I used to be. Most importantly, chilling in a bath can take a long time, especially if you aren’t using large quantities of ice. An immersion chiller is a heat exchanger that operates by simply carrying cold water through hot wort via a copper coil. Some designs feature another hook-up for recirculating cooled wort back into the brew kettle to form a whirlpool, increasing cooling speed and also helping to gather trub in the bottom of the kettle. A new chiller costs about $40-80 depending on its length, tubing diameter, and other features. The bulk of this cost is the copper tubing itself, which means unfortunately there’s not huge room for savings by going the DIY route. Nonetheless, I picked up a 20′ coil of 3/8″ tubing at Home Depot for about $22, which seemed about as good a price per foot as anywhere else (after shipping costs). The whole project was even more straightforward than my super-cheap stirplate. 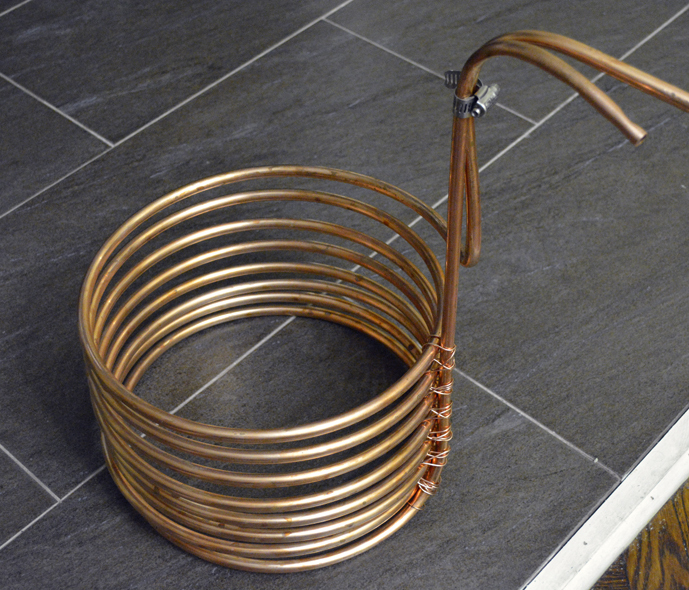 I created the coil of the chiller by wrapping the copper around a small steaming basket. At this stage the copper bent easily into the coil I would require. The more difficult portion of making the chiller is creating the uprights which lead from the coil to the hoses that will supply and remove water. Every time you work the copper, it begins to harden and become stiff, which makes it more prone to kinking. Bends of 90 degrees or more are particularly likely to kink the tubing. 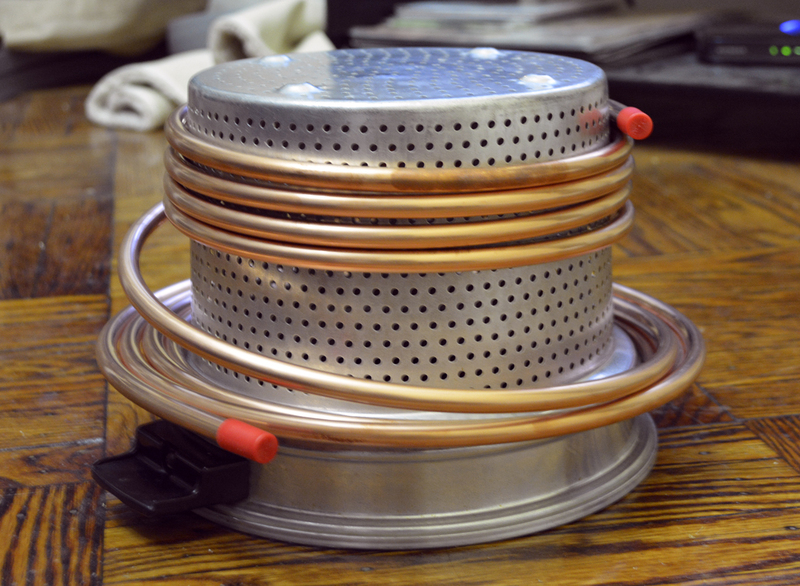 I separated the bottom coil by unreeling it about 18 inches (it would need to reach 14 inches upwards to clear the side of my kettle), then I used a tube bending spring to support the tubing while I bent it 90 degrees. I then made another bend away from the coil at the top of the upright to connect to the waste water hose. I made this bend a little greater than 90 degrees so any leaks at the hose would drip down along the hose rather than back into the kettle. I repeated this process to create another (shorter) upright from the top of the coil. The finishing touches were simply to weave some copper wire around the coils and upright to add some rigidity to the structure, to bind the uprights together, and then to clamp on some vinyl hoses for water inlet and outlet. 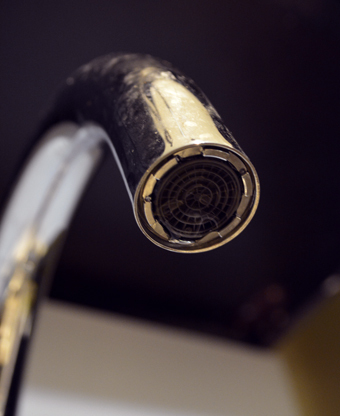 Many brewers run tap water through the chiller, but for a tap hookup you need to remove the aerator from the faucet and install a threaded hose adapter. My aerator requires a special wrench that runs about $10, so I am going with an alternative route — driving the flow using a submersible pump. The submersible pump is running me under $20, and affords me the additional benefit of being able to run water through the chiller that is even colder than my tap water. With the tap currently running at just under 70 degrees F, this is a huge advantage, as I could literally never cool the wort to 65 degrees F without colder water. It also keeps the connections simple; everything is just hooked up by vinyl hosing and hose clamps. I will be brewing up a new batch on Saturday, and will try to remember to get pictures of it in action and a measurement of the chilling rate. P.S. There is a bit of bait-and-switch in this article. 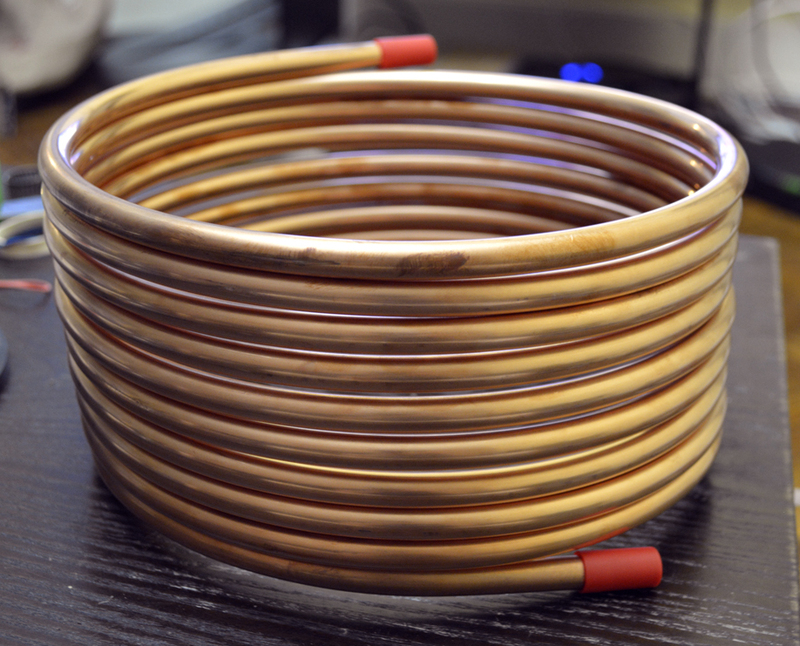 The pictures of the process of coiling the copper is not actually from assembling my finished chiller. I ended up buying two copper coils (an uninteresting story) and selling off my first chiller coil. My chiller has 5 additional feet of copper. I’m hoping to find someone with a tube cutter to lop off the funny extension on my intake, which I will subsequently fashion into a recirculating whirlpool arm. Since I don’t have plans to invest in a wort pump any time soon, the whirlpool arm will go unused for the foreseeable future. P.P.S. I may have been the only one who noticed, but I realize I haven’t had a pizza-related post in quite awhile. This will change soon. I am also hoping to update the recipe section of the site. This entry was posted in beer, equipment and tagged DIY, immersion chiller, temperature, wort chiller on August 23, 2013 by Dylan Bargteil.